Paddlefish (family Polyodontidae) are basal Chondrostean ray-finned fish. They have been referred to as “primitive fish” because they have evolved with few morphological changes since the earliest fossil records of the Late Cretaceous, seventy to seventy-five million years ago. Polyodontids are exclusively North American and Chinese. There are six known species: four extinct species known only from fossil remains (three from western North America, one from China), and two extant species, including the American paddlefish (Polyodon spathula) which is native to the Mississippi River basin in the U.S. and the critically endangered Chinese paddlefish (Psephurus glades) which is endemic to the Yangtze River Basin in China. 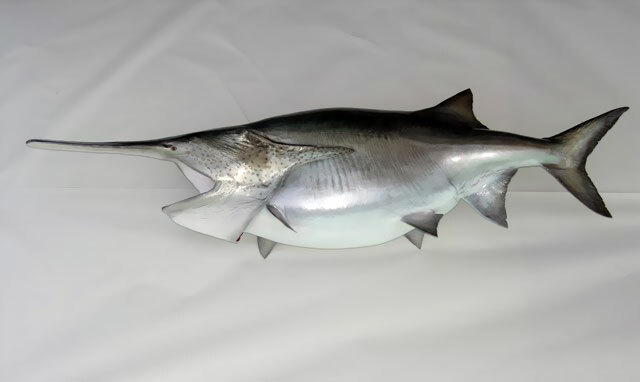 Chinese paddlefish are also commonly referred to as “Chinese swordfish”, or “elephant fish”.